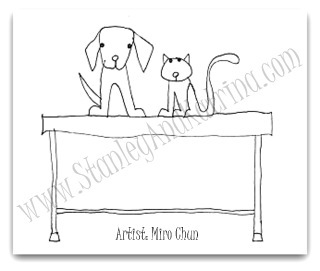 Stanley and Katrina: We have illustrations for our first book! Thank you Miro, for saying, "Yes!" We have illustrations for our first book! Thank you Miro, for saying, "Yes!" This is a sneak peek of one of the awesome illustrations that will be in our first book very soon! The artist and overall amazing human, Miro Chun, made our year when she said, "Yes." to illustrating our books. We have all of our interior illustrations in-paw and hope to have the updates and our brand new book cover finished and available by the end of the month. We are too excited to keep them all to ourselves, which is why we are sneaking one in this post. The above picture is of Stanley and me on the examination table at the veterinarian. What do you think? Isn't Miro amazing? She is an architect, a gardener, a ceramic artist, a pet-chicken keeper and, oh yeah, runs her own handmade greeting card company, Fold. She designs and fabricates every card with bits of wire, snips of thread and colorful scraps of paper. Just try to visit her blog and only look at one post or picture. We certainly can't do it. Her wire animal cards are the best. Please visit her blog, purchase a card (or earrings) and be sure to tell her that we sent you! We cannot wait to share her creations with you in our book.